The definitive stamps of Finland, issued between 1875 and 1892, would soon disappear, and, beginning in 1891, they would be replaced by Russian stamps! The "philatelic" Russification of Finland had begun! Of course, the Finnish people would refer to this period as the "sortokaudet" or the "times of oppression". In the years following the accession of Czar Alexander III to the Imperial Throne of Russia, a policy to make the Grand Duchy of Finland a more integrated part of the Russian Empire was implemented. Of course, the goal of this policy was to terminate Finland's autonomy. The assimilation of Finland into the Russian Empire did not succeed. 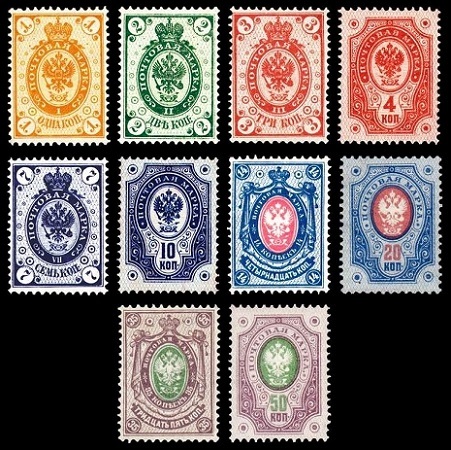 About sixteen years after the first Russian Imperial stamps were issued for Finland, the Russian Empire would be GONE, and the Grand Duchy of Finland would become a parliamentary republic! The fifteen definitive stamps of Finland shown above were issued in May 1891. The stamps are printed on laid paper with a Cyrillic letter and wavy lines watermark, and the stamps are perforated either 14 1/2 x 15 (Kopeck denominations) or 13 1/2 (Ruble denominations). 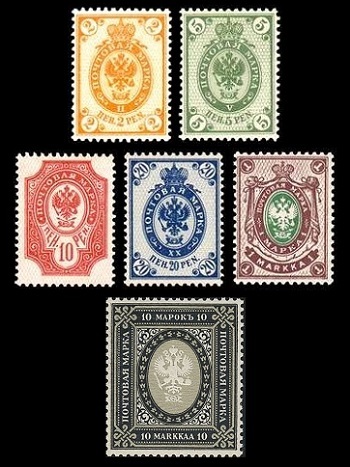 These stamps are identical to the contemporary Russian Imperial postage stamps. 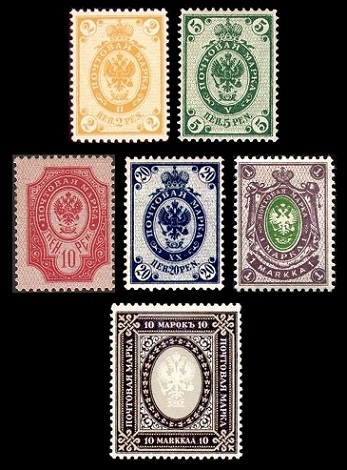 The common designs feature the Imperial Arms of Russia. The differentiating factor with these Finnish definitive stamps is that there are ornate circles, containing a colored dot, worked into each of the designs. Finnish philatelists refer to these stamps as the "Russian Designs with Rings". The inscriptions on these stamps are in the Russian language, and these stamps are denominated in Russian currency. 01 K. (1891 - Sc. #46) - Orange Yellow. 02 K. (1891 - Sc. #47) - Green. 03 K. (1891 - Sc. #48) - Carmine. 04 K. (1891 - Sc. #49) - Rose. 07 K. (1891 - Sc. #50) - Dark Blue. 10 K. (1891 - Sc. #51) - Dark Blue. 14 K. (1891 - Sc. #52) - Blue & Rose. 20 K. (1891 - Sc. #53) - Blue & Carmine. 35 K. (1891 - Sc. #54) - Violet & Green. 50 K. (1891 - Sc. #55) - Violet & Green. 01 R. (1891 - Sc. #56) - Brown & Orange. 03.50 R. (1891 - Sc. #57) - Black & Gray. 07 R. (1891 - Sc. #57) - Black & Yellow. 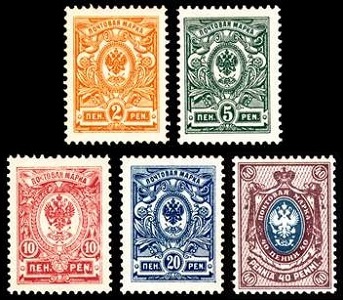 The four definitive stamp types of 1889 shown above were re-issued in 1895. These stamps are printed on wove paper, and they are perforated 14 x 13. 05 P. (1895 - Sc. #60) - Green. 10 P. (1895 - Sc. #61) - Rose. 20 P. (1895 - Sc. #62) - Orange. 25 P. (1895 - Sc. #63) - Ultramarine, Blue. The six definitive stamps of Finland shown above were issued in 1901. The stamps are typographed on chalky paper, and the stamps are perforated either 14 1/2 x 15 (Pennia and 1 Markka denominations) or 13 1/2 (10 Markka denomination). The inscriptions on these stamps are in the Russian language, but these stamps are denominated in Finnish currency. 02 P. (1901 - Sc. #64) - Yellow. 05 P. (1901 - Sc. #65) - Green. 10 P. (1901 - Sc. #66) - Carmine. 20 P. (1901 - Sc. #67) - Dark Blue. 01 M. (1901 - Sc. #68) - Violet & Green. 10 M. (1901 - Sc. #69) - Black & Gray. The six re-drawn definitive stamps of Finland shown above were issued between 1901 and 1914. The stamps are printed on ordinary paper, and they are perforated 14 1/4 x 14 3/4, 14 1/2 x 14 (Pennia and 1 Markka denominations) or 13 1/2 (10 Markka denomination). See the major catalogs for the re-drawing characteristics on each of these denominations. 02 P. (1901 - Sc. #70) - Yellow. 05 P. (1901 - Sc. #71) - Green. 10 P. (1901 - Sc. #72) - Carmine. 20 P. (1901 - Sc. #73) - Dark Blue. 01 M. (1914 - Sc. #74) - Lilac & Green. 10 M. (1903 - Sc. #75) - Black & Drab. The five new definitive stamps of Finland shown above (except for the 10 Markka denomination) were issued between 1911 and 1916. The stamps are printed on ordinary paper, and they are perforated either 14, 14 1/4 x 14 3/4 (Pennia denominations) or 14 1/2 (10 Markka denomination). 02 P. (1911 - Sc. #77) - Orange. 05 P. (1911 - Sc. #78) - Green. 15 P. (1915 - Sc. #79) - Rose. 20 P. (1911 - Sc. #80) - Deep Blue. 40 P. (1911 - Sc. #81) - Violet & Blue. 10 M. (1916 - Sc. #82) - Black & Greenish Gray. The following link features category-focused affiliated seller listings on the US eBay site. They may enable visitors to shop for and to buy specific items for the particular collecting subject they've just read about. The affiliated eBay seller auction lots provided by eBay, Inc. are not the responsibility of the management of this website. On high priced material, make sure the lots you are buying are properly authenticated or certified.